These chimichurri shrimp skewers are super quick to make and loaded with flavor, thanks to chimichurri sauce. They’re Whole30, paleo, and keto, too, making this quick shrimp recipe a healthy and easy dinner or appetizer. What is it about fresh herbs on slightly charred shrimp skewers that seem so. dang. appetizing in the summer? Maybe it’s that shrimp take all of, like, two minutes to cook. Or those green herbs promising bunches of flavor? Maybe it’s straight up getting to eat food off of a stick that does it for me. Whatever it is? Shrimp skewers with fresh herbs are quintessentially summer to me. And these chimichurri shrimp skewers are the king of all shrimp skewers! But instead of working up a complicated recipe using fresh garlic and herbs and lemon and seasonings, I took a shortcut: a insanely flavorful, real food, healthy shortcut that makes everything better. My chimichurri sauce recipe. <-> Insert drool emoji here! It’s the perfect chimichurri recipe in my experience, the just right blend of parsley and cilantro, grounded with dried oregano, spiced up with red pepper flakes, brightened with fresh lemon juice, and fortified with good-quality olive oil and lots of salt. It’s not so heavily parsley-ish like some chimichurris I’ve tried, nor is it heavy on the vinegar. It’s not weirdly sweetened, either; nope, it’s just right. And positively perfect for these chimichurri shrimp skewers. 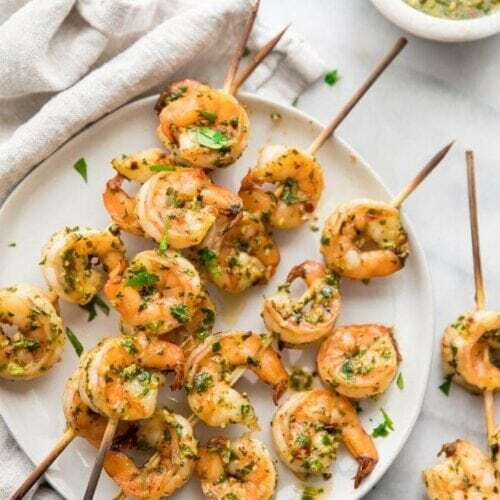 And all of those elements combine to make the loveliest marinade for these chimichurri shrimp skewers, as well as the perfect sauce for serving. If you’re anything like us, too, you’ll keep a jar of my chimichurri recipe in the fridge at all times, meaning this dinner recipe can come together in just a few minutes. Using already made, fresh chimichurri means this recipe comes together in just a few minutes. 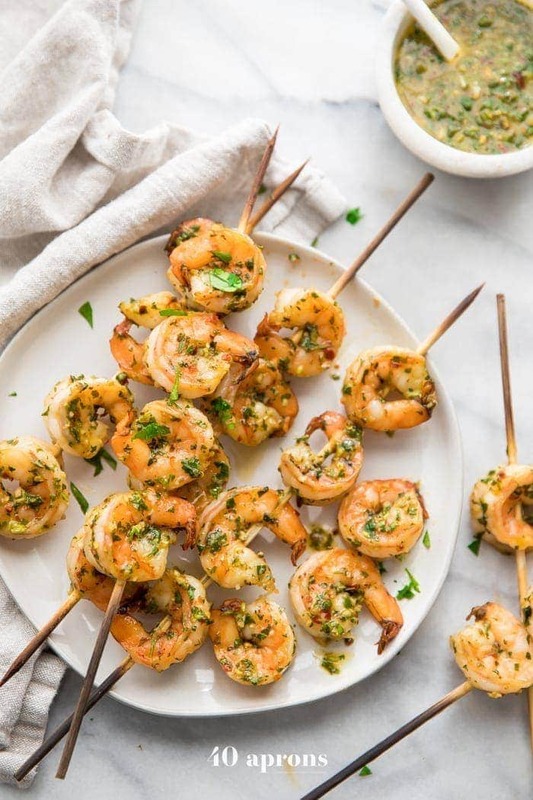 Chimichurri combines all the best elements of a marinade and fresh herb sauce for shrimp skewers: lots of garlic, fresh herbs, bright lemon juice, dried herbs, spicy crushed red chili flakes, and good-quality olive oil. Broiling the chimichurri shrimp skewers makes them super easy and doesn’t require hovering over a hot grill when it’s a million degrees outside. This real food recipe is naturally Whole30, keto, paleo, and low carb. It’s quick and easy enough for a weeknight dinner but elegant and fun enough for entertaining as a main course or appetizer. 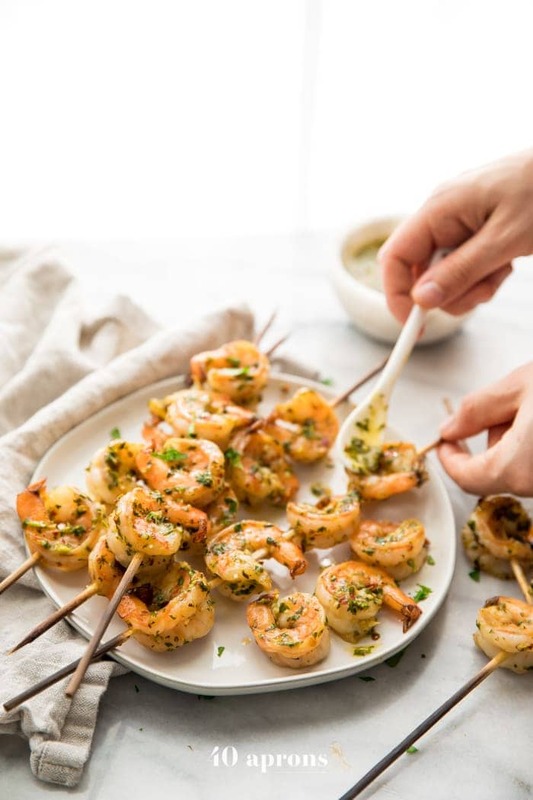 If you prefer to make these chimichurri shrimp skewers skewer-less, simply heat a small drizzle of avocado or olive oil in a large skillet over medium to medium-high heat. Add the peeled, marinated shrimp and cook, stirring regularly, for about 5 minutes, or until pink and no longer translucent. Grill these shrimp skewers instead: simply cook the skewers on a grill heated to about medium or medium high, 2-3 minutes per side. Make sure you use tongs and watch for flareups. Try scallops in place of the shrimp! You won’t need to make any changes to the recipe, really; still cook the skewers 2-3 minutes per side! Yum. Use my homemade chimichurri sauce recipe: it’s the best. I promise! It’s super easy to make, too. Check it out here. 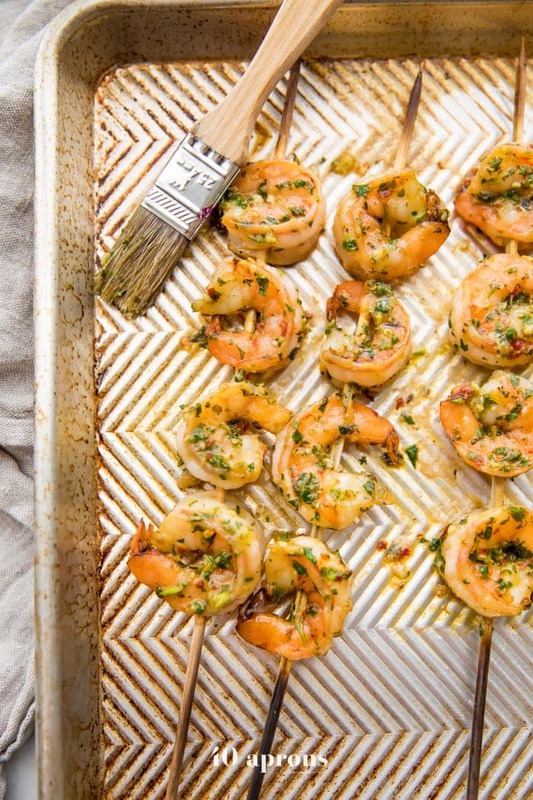 Use metal skewers to make this chimichurri shrimp skewers recipe even easier. Otherwise, if you use bamboo skewers, make sure you soak them at least 30 minutes before threading the shrimp on. This will prevent them burning or flaring up under the broiler or on the grill! Serve with tons of additional chimichurri for drizzling! While you wait for the shrimp to marinade, prep your side dishes. You’ll end up with a nearly 30-minute complete meal. Ready for this? Hold on to your hats… it’s a little complicated (JUST KIDDING). Toss your shrimp in the chimichurri. Forget about it for 30 minutes. Do something else, like make a salad or roast some broccoli or memorize Jonathan-isms from Queer Eye. Make sure you’re soaking your skewers if using bamboo during this time, or just opt for metal skewers instead for an easier life in general. Who gave us permission?! Head back to your shrimp. Thread them on your soaked or metal skewers. Preheat your broiler. Broil your shrimp for 3 minutes then carefully flip. Broil another 3 minute. 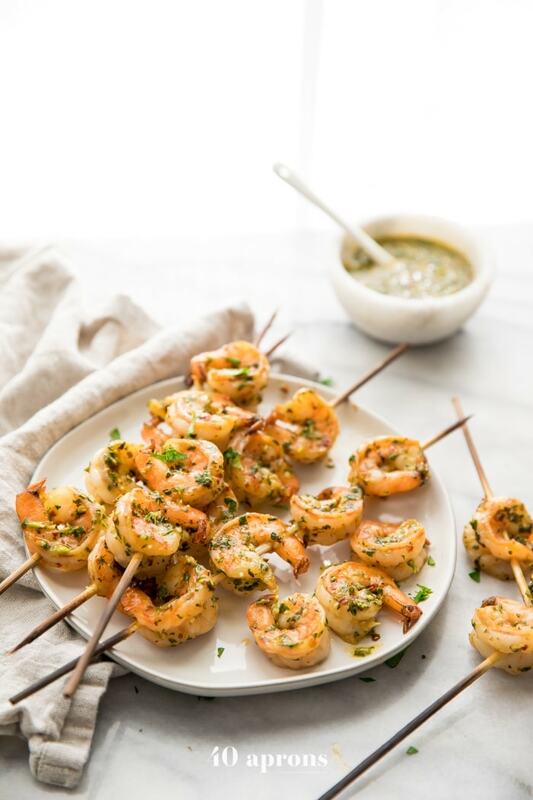 Tada – chimichurri shrimp skewers! Finished, sister. Serve with more chimichurri. 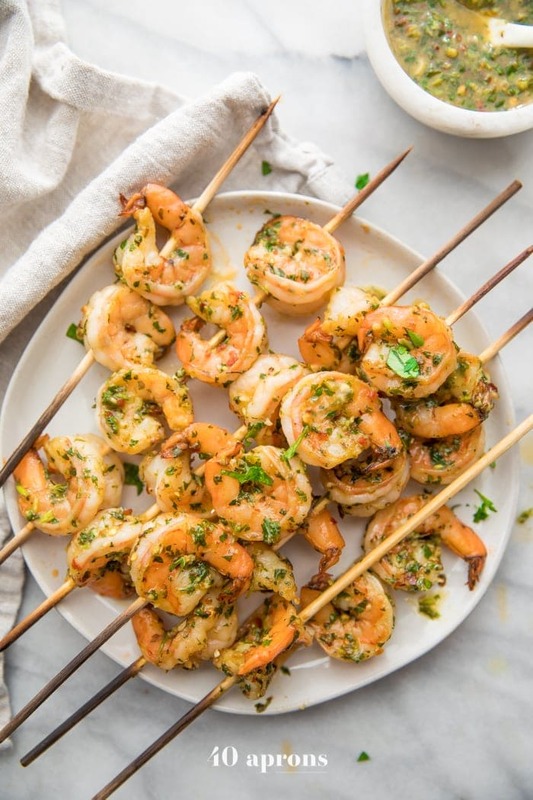 These chimichurri shrimp skewers take only a few minutes to make and are so flavorful. Whole30, paleo, and keto, this quick shrimp recipe is a healthy and easy dinner option and great for entertaining, too. Toss shrimp in chimichurri. Marinate at least 30 minutes, preferably one hour. Thread shrimp onto soaked bamboo skewers. Preheat your broiler. Broil 3 minutes, carefully turn, then broil 3 minutes on the second side. Serve with more chimichurri.